What if you were reading this news online and didn’t know who Clark Gable was? You could look him up in a source like Wikipedia, but that would mean leaving the page where the Icahn story was, and possibly never returning to learn more about the story. If you had a new Web browser add-on called Curiyo, you could simply click on his name and learn about Mr. Gable from Wikipedia or other sources in a pop-up box — never leaving the page or the story. Curiyo underlined Clark Gable’s name in a story about Carl Icahn. Clicking on the actor’s name brought up a box showing sources with information about him. Then you could dismiss the box with another click and keep reading the news story. 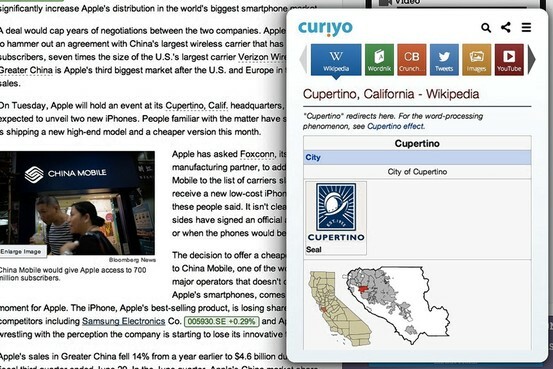 Curiyo is a free extension — a small piece of software that adds a feature to a browser. 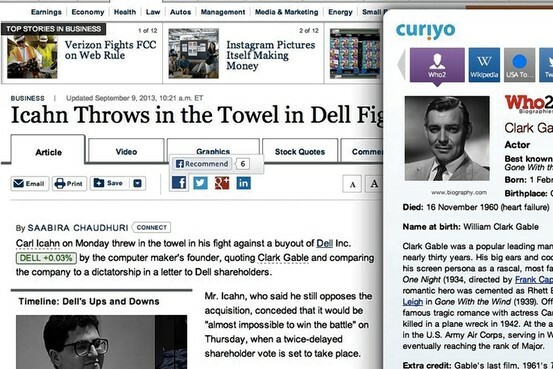 Starting Tuesday, Curiyo can be downloaded at Curiyo.com. It works with all four major browsers on both Windows and Mac: Google’s Chrome, Microsoft’s Internet Explorer, Apple’s Safari and Mozilla’s Firefox. It comes from an Israeli company of the same name and was developed by the founder of the reference website Answers.com. I’ve been testing a pre-release version of Curiyo for about a week as I browsed the Web, trying it out on both Macs and Windows PCs and on all four of the browsers. Curiyo generally worked well and I can recommend it, especially for readers like me, who tend to get interrupted by unfamiliar references and find it hard to continue reading without looking them up. Curiyo places a faint dotted line under terms, names and phrases its algorithms suspect readers will want to know more about. When you move your cursor over the dotted line, a tiny question mark appears, and when you click on the underlined words, the Curiyo box pops up. This box presents you with a choice of sources you can use to learn more, arrayed along the top. These sources are dynamic and context-sensitive. They include not only Wikipedia and some dictionary sites, but, when the subject is relevant, news sites like USA Today and the Huffington Post; sports reference sites; the entertainment reference site IMDb.com; images; YouTube; Twitter; and more. Curiyo also allows you to perform a Google search on the chosen topic. In the case of Boston Red Sox slugger David Ortiz, I was able to consult his up-to-date season and career stats from the respected site Baseball-Reference.com. You can turn most of these sources off or on to get just the ones you want to consult. If Curiyo hasn’t underlined a term you’d like to explore, you can try looking it up anyway, by simply performing a “long click” — clicking for a couple of seconds — on a word. For instance, in one story I read about the Syrian crisis, Curiyo underlined such things as the names of the Russian and Syrian foreign ministers. But it didn’t underline the phrase “chemical weapons.” A long click on the word “chemical” brought up the Curiyo box with information about chemical weapons, because Curiyo’s servers deduced I wanted information about the whole phrase. Curiyo doesn’t interfere with normal links on Web pages. These continue to do whatever the publisher intended. And its pop-up box can be moved anywhere on the screen so it doesn’t cover up content. This new software is, in a way, a modern, dynamic version of the first well-known product from the same developer, called GuruNet. That software, released in 2000, allowed you to click on any word anywhere on your Windows computer and get definitions and static encyclopedia information. But Curiyo does much more and offers fresh information, like the latest news or Twitter comments. Curiyo is free for users, but it has a business side. The company is inviting Web publishers to add their sites as sources on the service. That way key words common on the publishers’ sites would be added to Curiyo and help them get more user traffic. The company, though, says it won’t accept any and every site. It hopes to make money by selling ads, though none are present now. I did find a few drawbacks to Curiyo. It often took 20 seconds or more for the product’s dotted lines to appear. The company says this is because it waits for the whole page to load first. Also, as in the chemical-weapons example, it was sometimes hard to figure out why some terms were underlined and others weren’t. Finally, Curiyo can perform differently on different sites. While it underlined “Clark Gable” in the Dell story I read on one news site, it didn’t underline the name in another site’s version of the story. Overall, I found Curiyo to be a valuable and easy-to-use addition to Web browsing.